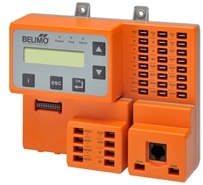 Belimo Americas is pleased to announce the release of their ZIP Economizer. The ZIP Economizer has been developed to allow for easy user interaction when setting up or troubleshooting Economizer systems and RTUs. It is the most technologically advanced Airside Economizer solution in the market. The economizer is designed to provide the most energy savings through advanced economizer logic strategies and is compliant with the most recent energy codes and standards (ASHRAE 90.1-2010, IECC-2012, California Title 24-2013, ASHRAE 189.1-2011). The ZIP Economizer reliability and features mean economizers no longer have to be jumpered out or fixed closed and results in getting building energy efficiency back on track. 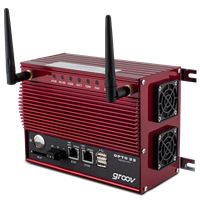 Using only a modern web browser, groov securely lets industrial automation end-users, system integrators, machine OEMs, building managers, technicians, or any authorized person quickly build and deploy browser-based interfaces for automation, monitoring, and control applications. These operator interfaces can then be viewed on almost any computer or mobile device regardless of its manufacturer or operating system, including PCs, tablets, smartphones, and even smart high-definition televisions. groov is intended to augment traditional human-machine interfaces (HMIs) by making important information available at any time and in any location. In a major drive to out-Apple Apple and out-Google Google, Samsung revealed the Samsung S 4 today (though with no pricing) and a bevy of services meant to compete with Google's Android Navigation, Picasa, and Translate, as well as with Apple's Apple TV, iTunes in the iCloud, Siri, and iPhoto. It also has a few truly unique technologies, including new temperature and humidity sensors. But the most intriguing new capability is its infrared gesture capability, which lets you access some smartphone features without actually touching the screen or when wearing gloves. Called Air Gestures, the capability lets you can scroll, swipe, and do other basic gestures, such as wave your hand to answer a call. Tracksticks are tiny GPS location recorders capable of continuously logging their own location histories for extended periods of time. The Trackstick records its own location, time, date, speed, heading and altitude at preset intervals. Traveled routes can be viewed directly in Google Earth TM. Includes GPX photo stamping feature for adding your favorite photos to your own maps. The Trackstick II receives signals from twenty four satellites orbiting the earth. With this information, the Trackstick II can precisely calculate its own position anywhere on the planet to within fifteen meters. The Trackstick II will work anywhere on the planet Earth. Your exact location and the route traveled can be viewed and played back directly within Google™ Earth. Everything is included and there are no monthly fees. Exele Information Systems, an industry leader in alarm management, notification and remote monitoring software has announced major enhancements to their TopView® software suite with the release of TopView 6.15 with Notification Alarm Acknowledge Links. Within TopView’s alarm notification messages (email, SMS, …), users can now include a web page link which will allow the notification recipient to acknowledge the alarm directly from their smartphone or desktop. 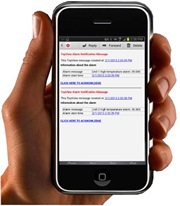 TopView includes an embedded web server which is used by the TopView Mobile Web App. Within the Mobile Web App, each monitored point contains a details page which includes an acknowledgebutton if the item is currently unacknowledged. Crestron announced the release of the 5-inch TSW-550, the newest and smallest addition to its Core 3 UI™ powered family of smart phone and tablet styled touch screens. TSW-550 joins the previously released 7-inch TSW-750 and 10-inch TSW-1050 to complete the versatile touch screen family. High resolution graphics and brilliant colors bring Core 3 UI graphics to life with this next generation of dynamically rich user interfaces for controlling the home or commercial environment. Featuring a spectacular ultra-bright display, capacitive touch screen technology, PoE, H.264 streaming video, and edge-to-edge glass, TSW-550 provides a stunning interactive automation experience. The HOBO UX100 Series is Onset’s next-generation family of data loggers for tracking temperature and relative humidity in indoor environments. HOBO UX100 data loggers offer a dramatic price/performance advantage over competitive products by delivering higher accuracy, larger measurement capacity, and more LCD display features to make environmental data collection faster and easier than ever. The loggers provide a variety of features to reduce deployment time, and offer new logging modes for recording and displaying more detailed data without extensive post-processing or memory use. EL-WIFI-T. This new sensor measures the ambient temperature of the environment in which it is situated. Data is transmitted wirelessly via a WIFI network to a host PC and viewed on screen showing the logger’s current status, a graph of all logs since the session was started or any alarm reached during the logging session. Multiple units can be set up on the same WiFi network, including other temperature and temperature/humidity variants of Lascar’s WiFi range, viewable at the same time on screen.